Area 51 is the most secretive military base in the United States, a base that U.S. government officials to this day still barely acknowledge because of its top secret development and testing of experimental aircraft and weapons systems. But a slew of Cold War-era documents have finally been declassified, and National Geographic has discovered a rather low-tech method the military used to hide its high-tech prototypes. In the '50s and '60s, one of the most tight-lipped projects was OXCART, the program intended to create the successor to the U-2 spy plane. 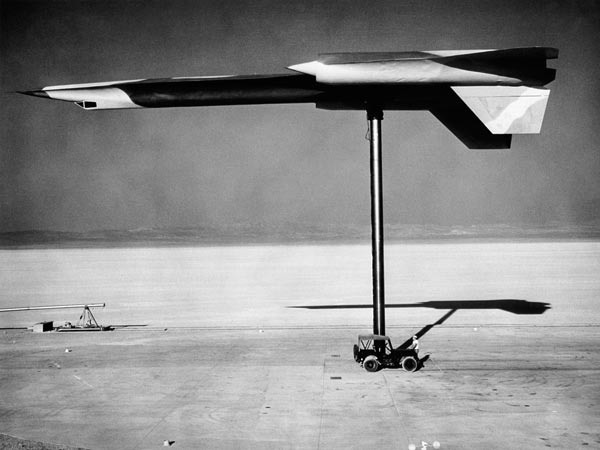 Though expected to be undetectable in flight, the A-12 reconnaissance aircraft was completely visible to Soviet Union spy satellites when grounded. To combat the Soviet spy satellites, the U.S. Military would hide the planes under overhead sheds when the satellites made their passes. But no matter where the planes were, their shadows would create cooler silhouettes in the hot Nevadan desert, which could be detected by infrared. Making the prototype completely visible when in ground development and testing meant getting creative. Fake planes were constructed out of cardboard and other mundane materials to cast misleading shadows. The real aircraft were still tucked away out of sight, whereas these faux prototypes were in plain sight. Sometimes, to mimic the engine heat from a just-landed aircraft, military personnel would place heaters near the faux engines. A faux A-12 being radar tested on a pylon in the late '50s. The result? The Soviets never solved the secrets of OXCART before the program was made public in the mid-'60s. I wonder what other simple, yet ingenious DIY projects the military employed to keep its secrets classified? More declassified information about Area 51 can be found at National Geographic.